Billy Kaye's career in percussion has spanned nearly 60 years. Billy Kaye was born Willie King Seaberry in 1932 in North Carolina. 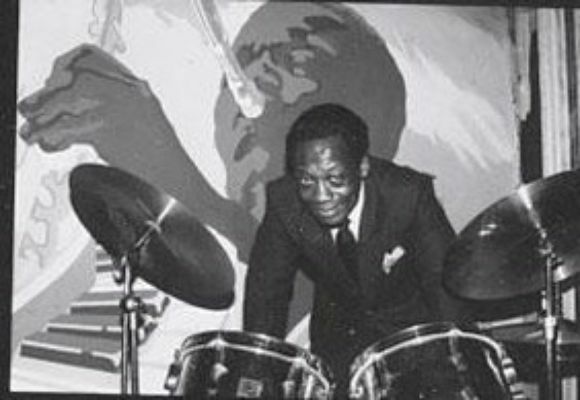 He began performing as a drummer in 1950 with Percy Mayfield, and he organized a trio to play service club shows while stationed in Libya. During his years in the service, he met and played with Hans Koller (German saxophonist), Benny Green (trombonist) and Matthew McGee (former Duke Ellington Orchestra member). In the early 1960's, Billy Kaye led a group at the Monterey Club in New Haven called the Melody Trio, featuring Houston Person on tenor saxophone and Fran Gaddeson on organ. Later, he led a quartet of Clarence Thompson (piano), Eddie Daniels (bass) and Frank Strozier (alto sax). Billy Kaye also played with the Illonois Jacquet Quartet and joined the George Benson Quartet in 1966, along with Lonnie Smith and Ronnie Cuber. He was the featured drummer for guitar and trumpet workshops at George Weins original Newport Jazz Festival. Billy Taylor led the rhythm section, with Gene Taylor on bass and featuring trumpeters Howard McGhee, Red Allen and Ruby Braff. Billy joined the Lou Donaldson organ group in 1967 and played with them for over 20 years, touring Europe and recording. During this time Billy also played and recorded with Hank Crawford and Stanley Turrentine, as well as spending a year and a half with the Thelonius Monk Quartet featuring Charlie Rouse. In the 1980s, Billy Kaye became a composer and started to lead his own group. He toured NorthWestern Paramount Theatres Concert Tours opposite Larry Graham, Herbie Hancock and Weather Report. In 1989, he appeared at the Newport Jazz Festival in 1989 as the drummer with Jimmy Smith, John Faddis, Steve Brown and Houston Person, and also worked with the Sun Ra Omniverse Arkestra. He has worked with vocalists Eddie Jefferson, Ruth Brown, and Maxine Brown, and worked with Gloria Lynne throughout the 1980s and 1990s. He has worked with some of the greatest artists in jazz and blues in both live and recorded performance, and he continues to perform, compose and produce with no plans of retirement. He has also worked as a music educator through the Jazz Foundation of Americas Jazz Foundation in Schools program, conducting one-hour educational performances in New York City public schools.